Mavrovo National Park's main river is Radika it flows through a spectacular, 30 kilometer- long gorge from the northern to the southern boundary of the park. Radika`s source area lies high above timberline, in the desolate highlands of Mt.Shar: here, a mountain glacier has widened and flattened the valley floor, cutting off the spurs and straitening the course of the river. Countless sparkling streams transverse these glacial landscapes, eventually joining the main flow of the Radika. Beyond the point where the glacier malted, the river gets squeezed between high mountains, which force it into a narrow and steep bed. Radika picks up more speed and power as larger tributaries join in; its rage increasing as the canyon deepens, the river begins to tumble down ferocious rapids and even cascades. This spectacular show is enhanced by Radika`s turquoise green color, as well as the lush subtropical vegetation clinging to the limestone cliffs. The park`s extensive drainage system includes many smaller rivers and streams; they have formed canyons and gorges of their own, sometimes even more impressive than that of of the Radika. 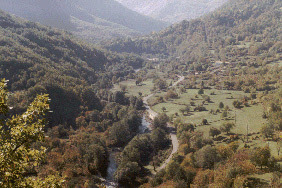 From the left (eastern) side, the Radika receives several large tributaries, including to Adjina, Mavrovska and Mala rivers. 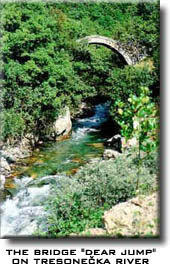 The northernmost Adjina river has knifed a narrow and steep gorge into the remote Vratsa plateau. Small circular cave openings are visible along the gorge's sides. 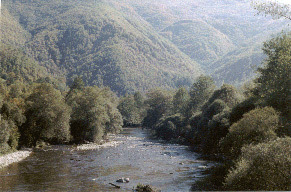 Another prominent tributary is the Mavrovska . The upper part of its valley has been dammed to form the Mavrovo reservoir; still, the lower section has been preserved. In this one of the most beautiful gorges in the park, densely vegetated side-canyons are interrupted by limestone pinnacles rising sharply into the sky. The third tributary, the Mala river, wends its way across the southern boundary of the park. Its raving beauty is accentuated by the famous "Stag's jump-a gracious 18-centry Turkish bridge. above the source of the river is counterbalanced in the valley of the Tresonechka , where powerful springs burst from the grayish cliffs above the river`s course. The Tresonechka itself puts on an impressive natural display in the upper part of its valley, with three consecutive waterfalls,20,10 and 8 meters high, respectively..
To the west, the Radika receives another major tributary, the Ribnichka river. 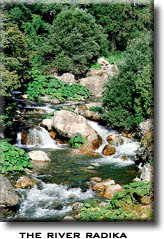 Its valley is and more peaceful , and only in a few places does the river get compressed into narrow gorges and rapids. However, Ribnichka numerous unspoiled tributaries are far more unsettled ,breaking frequently into foaming rapids. A mighty glacier turned the upper part of Ribnichka`s valley into a flat highland plateau, whose bareness stands in stark contrast with the densely wooded lowlands. Predilection casinos? vouch exchange towards this advanced [url=http://www.realcazinoz.com]casino[/url] advisor and giving online casino games like slots, blackjack, roulette, baccarat and more at www.realcazinoz.com . you can also inspection in our nifty [url=http://freecasinogames2010.webs.com]casino[/url] orientate at http://freecasinogames2010.webs.com and take upright proficiently touched in the ceo ! another in [url=http://www.ttittancasino.com]casino spiele[/url] transfer is www.ttittancasino.com , because german gamblers, heyday magnanimous online casino bonus. the finest [url=http://de.casinoapart.com]casino[/url] to UK, german and all to the world. so as a help to the high cape [url=http://es.casinoapart.com]casino en linea[/url] baulk us now. I seldom comment, however i did some searching and wound up here "THE RIVER RADIKA". Is it just me or does it seem like some of the responses come across as if they are coming from brain dead visitors? :-P And, if you are writing on additional sites, I would like to follow anything new you have to post. Thanks for sharing your thoughts about acheter des vue sur youtube.